Harold Felton was working to re-connect a new sewer line to a West Seattle house when the trench where he was working caved in, burying him in wet soil. His boss is accused of criminal negligence in his January 2016 death. A Seattle contractor accused of criminal negligence is believed to be the first employer in state history to face felony charges in connection with an employee’s death, according to the state Department of Labor & Industries (L&I). Phillip Numrich is charged with second-degree manslaughter for allegedly violating and ignoring safety regulations, leading to the collapse of a sewer trench at a West Seattle home in January 2016 that killed 36-year-old Harold Felton, say King County prosecutors. Numrich, 40, was also charged with violation of labor safety regulation with death resulting, according to the criminal case investigated by a Labor & Industries safety and health officer. A $20,000 warrant has been issued for his arrest, but as of Tuesday afternoon, he had not been booked into jail, jail and court records show. A message left on Numrich’s business phone was not returned Tuesday. “It is significant,” Elaine Fischer, an L & I spokeswoman, said of the felony case against Numrich. She noted an Everett-based landscaper was charged with a misdemeanor crime in 2016 after a 19-year-old employee was killed in a bark-blower truck in Duvall two years earlier. Numrich previously owned Alki Construction, which has since gone out of business. He now owns Alki Sewer, a business that has garnered online reviews as recently as May, charging papers say. “Because his workplace safety measures were so grossly inadequate in this case, causing the death of the victim, his continued operation of a similar business puts other workers at risk,” senior deputy prosecutors Patrick Hinds and Melinda Young wrote in charging documents. Harold Felton, 36, died Jan. 26, 2016, when he was buried in a trench cave-in at a West Seattle house as he worked to re-connect a new sewer line to the residence, charging papers say. 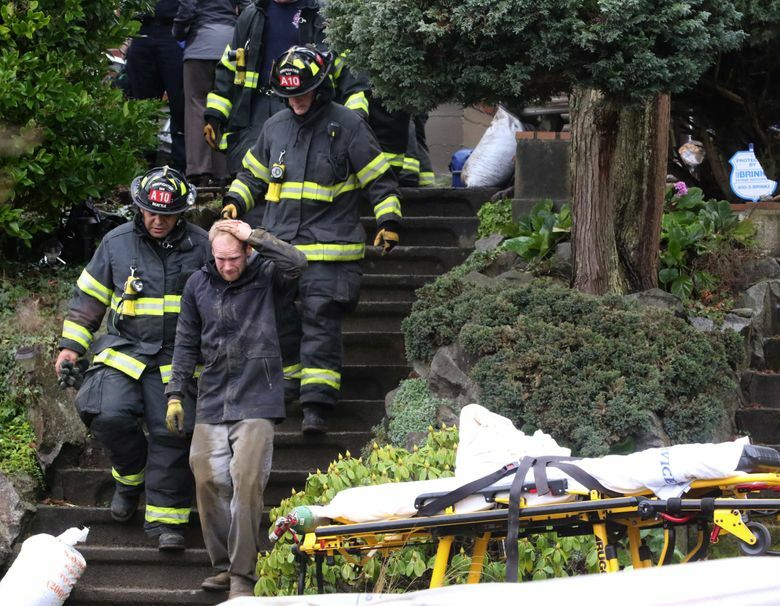 Despite rescue efforts by a Seattle Fire Department technical-rescue team, Felton died before firefighters could pull him out of a trench that was 8 to 10 feet deep in unstable, saturated soil, say the charges. According to a news account, it took several hours to pull Felton’s body from the collapsed trench. In July 2016, Numrich was fined $51,500 for willful safety violations over the trench collapse, Fischer said. He appealed and entered a settlement agreement, affirming the violations that November. Since then, Numrich has been making payments on a reduced fine of $25,750, according to Fischer. She said it was King County prosecutors who decided to pursue felony charges — a decision L&I officials fully support. The Seattle Times attempted to contact Felton’s family, but phone numbers listed for relatives appear to have been disconnected. Ten days before the fatal cave-in, Numrich, Felton and another employee began work to replace a sewer at a house in the 3000 block of 36th Avenue Southwest, digging a trench from where the sewer exited the house’s concrete foundation and another trench where the sewer connects to the city’s sewer main in the street, the charges say. After the old sewer line is disconnected from the home’s foundation and at the street, a large cable is threaded through the old sewer line. On one end, the operator connects a large cable to the tip of a steel cone, and at the other end, the cable is connected to a large, hydraulic pulling machine. The operator then connects a new plastic sewer line to the back of the cone and uses the hydraulic machine to simultaneously split the old sewer line open while pulling the new plastic sewer line into place. One trench was dug at the front of the house and a second behind the house, which is where Felton died, the charges say. According to the charges, Numrich was the only “competent person” on the work site, a legal definition that means he was supposed to be able to identify existing and predictable hazards that could endanger employees. However, he was away buying lunch when the collapse occurred. The charges say Numrich confirmed in a voluntary interview that the soil at the house was “Type C,” which is the least-stable kind of soil and requires the most rigorous shoring under state regulations. Not only did Numrich fail to properly shore up the trench where Felton died, he also left the trench open for 10 days, far exceeding the usual two to three days a trench is typically left open, say the charges. During that period, it rained several times, saturating the already-unstable soil and making it more likely to collapse, according to the charges. Additionally, Numrich witnessed Felton using a handheld vibrating tool inside the back trench, which caused further soil instability, the charges say. But instead of warning Felton of the danger or ordering him out of the trench, Numrich left the work site to buy lunch for himself and his two employees, say the charges. Felton died while Numrich was gone, according to the charges.